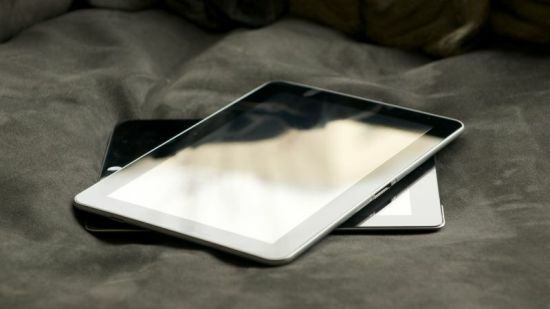 Poll: should Apple fear Google's upcoming flagship 10-inch Nexus tablet? Poll: should Apple fear Google’s upcoming flagship 10-inch Nexus tablet? As we told you earlier today, Google is thought to have teamed up with Samsung on a new flagship tablet. The device is believed to feature a ten-inch display with a greater resolution and pixel density than the iPad 3’s Retina display. The search company reportedly feels so confident about the upcoming tablet that it’s gonna adorn it with the Nexus branding. With Amazon having recently unveiled an 8.9-inch high-end tablet and now Google eyeing the same market segment, rivals are taking the fight for tablet supremacy to Apple’s own turf, where the iPad dominates. Should Cupertino be concerned? Of course, Apple successfully dealt with competitors in this space before, notably Samsung’s large-sized Galaxy Tab 10.1 (seen below) and Note devices. But Samsung lacks Google’s branding and determination and if brisk Nexus 7 sales are an indication, a ten-inch Nexus tablet should give the iPad a run for its money. So, should Apple be concerned? Should Apple fear Google’s 10-inch Nexus tablet? 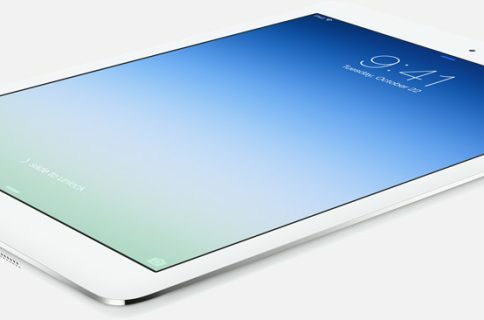 By the way, it’s interesting how Samsung originally supplied high-resolution screens for Apple’s third-generation iPad although it could have beaten Apple in bringing such a high-resolution display to its own tablet series. I suppose the Android software wasn’t ready at the time to power that many pixels on a mobile device. But with Android Jelly Bean debuting on Google’s Nexus 7 tablet and the warm reception it received, the search giant is now able to build a product capable of challenging the latest iPad. NPD DisplaySearch analyst Richard Shim told CNET that Google has commissioned Samsung to build a 10-inch Android tablet that will be marketed under Google’s Nexus brand and feature an ultra high-resolution display thought to go beyond the iPad 3’s 2,048-by-1,536 pixel resolution Retina display. Specifically, the device is thought to have a 2,560-by-1,600 pixel resolution display with a pixels-per-inch density of 299. The iPad with its 9.7-inch display has a pixel density of 264 PPI. It’s going to be a high-end device. They’ll partner with Samsung and co-brand it with Samsung. Google currently has a seven-inch tablet, marketed as the Nexus 7 and manufactured by Asus. Apple should send tomorrow invitations to a press conference where the company is expected to announce a long-rumored iPad mini, designed to be smaller and more affordable in an obvious effort to take on tweener tablets that Jobs passionately ridiculed. Amazon also last month introduced an 8.9-inch tablet called the Kindle Fire HD, designed to take on the iPad and starting at $299 (shipments start on November 20). As Apple is readying its answer to the crop of smaller and inexpensive tablet, Google will be attempting to slow down the iPad’s march on the high-end. The Nexus branding should help push the rumored flagship Nexus tablet. That ultra high-rez screen won’t hurt either, though I wonder about the performance. Android is not as optimized for intensive graphics performances as iOS is and unless Google’s done some serious under-the-hood pluming work – I’d expect jerkiness and lagging performance. 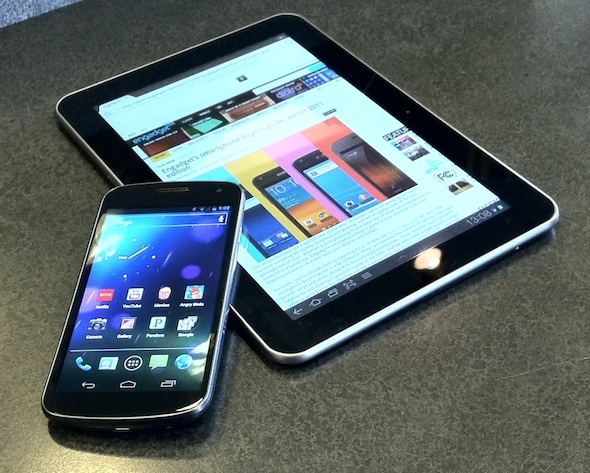 Pictured on the top: a Galaxy Nexus smartphone and a Galaxy Tab tablet, both made by Samsung.